The lucrative fundamentals of consumer goods are likely to spur the huge demand for products over the coming eight years. This significant growth is primarily attributed to the rising labor & service markets, driving the growth in disposable income of the individuals. As per the research, it is projected that by 2025, the global economy is likely to get shifted from Western regions to Eastern countries. Especially the Asian countries will drive significant growth due to urbanization and the burgeoning middle-class population. Further, by the year 2025, 4.7 billion people are supposed to move in the urban areas worldwide. Particularly in the Asia Pacific, seven of the top 10 global cities will account 10% of the global population. These anticipated markets will drive the huge consumer spending on consumer electronics and goods. 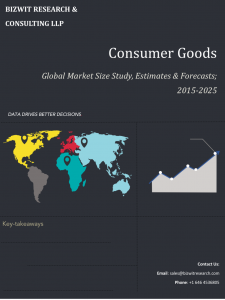 We have identified and listed the growth avenues in the consumer goods industry which are mentioned below.